oh. my. G-d. i just found out tooth & nail is releasing a 2-cd/1-dvd box set of the crucified’s material, including the kgb demo, a remastered pillars of humanity, live videos, outtakes, etc. out june 30th. and only $20. given the history of the crucified, their (specifically salomon’s) derision for being reminded of the band, etc., i’m really curious what the band’s perception is of this reunion. perhaps time has healed the wounds, given them wisdom and an ability to reflect on those times — to acknowledge the bad but be pround and happy about the good. at least i like to imagine that’s the case. update: haha. i’m watching a video of their recent show (june 14th 2009). salomon came out during the opening music (“hateworld”), walked around smiling and waving at people, walked up to the mic, then said “what happened? you guys got old!” and smiled his ironic smile. friday evening i ate at empire cafe and then met up with amateria (jamie) and we went to coffee groundz for some coffee and conversation. pushkin is kind of considered the father of 19th century russian literature, and as i enjoyed dostoevsky’s crime and punishment and am currently enjoying tolstoy’s anna karenina i figured i’d probably also enjoy pushkin’s work (and seeing some of the work that influenced the authors i’ve read). saturday evening i went down to the potts house. when i got there i asked about alcohol, but we never got any. i helped jack with his linux server, then we watched snl and got some food. after that, sue went to bed and i watched the second punisher movie while jack fell asleep. the movie was fair — the cinematography was pretty cool, but it was (like the first one) too cartoony to me. maybe it’s just been too long since i read the punisher, but i don’t remember it being as…silly. or maybe i just read the less silly stuff. overall, the silliness and soap opera factors were big reasons i didn’t like most of marvel’s stuff that much back in the day. today i met the potts (minus the boys, who are visiting their grandparents) for lunch at bj’s in sugarland. they were giving away free glasses to fathers for father’s day (with the purchase of a beverage). jack and sue wanted me to get one so they could get two glasses, but i wasn’t really interested in doing it. at some point sue sue said “but you’re a father…” i’m not sure what she meant but i began acting like i was speaking to the waiter “yes, i’m a father. but my unborn child died in my wife, then she had a miscarriage. then she had an affair and divorced me. and yesterday was my wedding anniversary.” i think sue felt bad after i said that last line. but it was true. and the whole thing really made me more sad than i’d expected it to. i knew i should have drank yesterday. and i didn’t make up for it today either. yet. taurian’s website said they are open sundays 2-10pm, but when i went by there around 8pm they were closed. i guess i’ll go back later. “of course the mysterious, enchanting kitty could not love a plain fellow, such as he considered himself to be, a man so ordinary and undistinguished. […] he thought a plain kindly fellow like himself might be loved as a friend, but to be loved with the kind of love he felt for kitty, a man must be handsome, and above all remarkable. “the mysterious, enchanting kitty herself could not love such an ugly person as he conceived himself to be, and, above all, such an ordinary, in no way striking person. […] an ugly, good-natured man, as he considered himself, might, he supposed, be liked as a friend; but to be loved with such a love as that with which he loved kitty, one would need to be a handsome and, still more, a distinguished man. friday evening was a maintenance window evening. the rest of my weekend seemed to involve being tech support for other people. *grin* saturday i went by republic harley and picked up my 2nd key and security fob, then headed to the potts’ house. i ate supper, watched snl, then reconfigured jack’s linux server so it would work on his home network. sunday i met kelli at antidote and tried to get safari working on her apple ibook. i eventually decided something was messed up with a corrupted update or something, as i couldn’t get software update or safari to work. i tried reinstalling the 10.3.9 update by downloading the package from the apple site, but that didn’t fix things. eventually i installed firefox 2 and told her she could use that as a workaround. the other suggestions i saw for fixing the apparent problem involved arching the account(s) and reinstalling the os. ick. from antidote and kelli, i drove over to the nova lair (jamie/amateria’s place). i helped her re-set up a wireless router, as well as test some stuff and move a desktop. i then ate supper with her and her kids. and thus ended my tech support weekend. today i loaded the iphone 3.0 software. i had some network troubles, then the iphone activation server kept not responding. i tried numerous times over an hour or two. finally i read in a comment on a wired magazine blog entry that if you disconnected your computer’s network after starting the update but before it actually tries to contact the activation server, it would do the update. i tried that and it worked. of course, then i had 30 minutes to an hour of being worried i’d bricked my iphone since itunes kept complaining that it couldn’t communicate with the iphone and the iphone seemed to keep rebooting. eventually things got sorted out and the 3.0 install was a success. 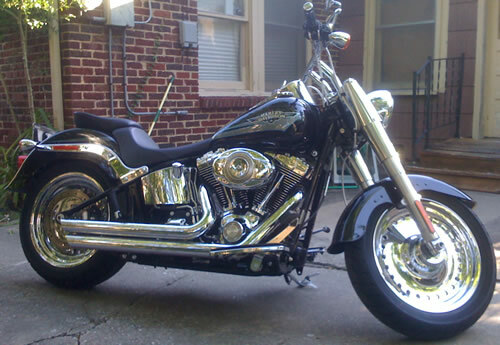 a 2009 gloss black harley-davidson fatboy. factory options on the bike included the chromed versions of the rims and the security piece for the ignition. 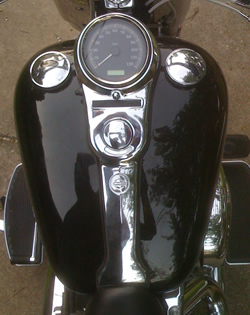 i replaced the stock seat and passenger pillion with the “brawler” versions. they’re basically narrower and thinner. 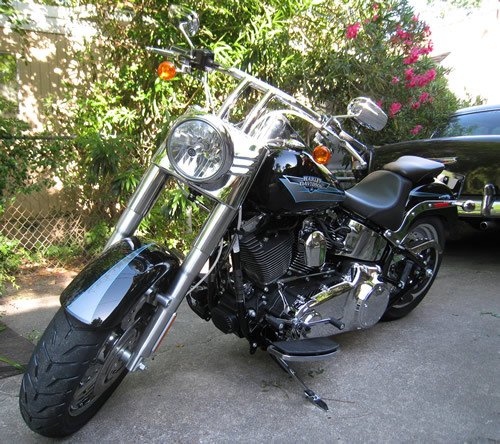 i replaced the stock pipes with vance and hines staggered bigshots. they sound good, although i don’t think they’re as loud as the hard krome k-2’s that were on my honda vtx1300. 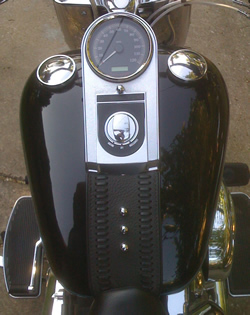 and i replaced the stock buckhorn/beach bars and risers with a t-bar (drag bar) with integrated risers. oh, and different handles and brake/clutch levers, as well as braided cables. within a couple of days of getting it, i let brad and jason know i’d gotten a new bike. pretty soon brad asked me to go riding. i spent several evenings that first week or two riding around with him, going from hang out to hang out, drinking, eating, etc. one night we hung out on his porch until 2:30am, another we picked up a new friend of his and all three of us rode around downtown and midtown. the break-in period is 500 miles, so i was trying to get street driving so the rpms would be well-distributed. i’ve been riding it to work pretty much every day, and most days i ride around at least a bit in the evening. i crossed 500 miles on sunday or monday. i’m still trying to get used to having foot boards instead of pegs. i’m trying to give them a proper chance. but so far they are still sort of awkward to me. i’ve yet to use the heel shifter, although i haven’t taken it off yet either. so far the only thing it’s been good for is catching my pants leg when i go to put my foot on the ground. friday night was the geek gathering. it was a pretty impressive turnout. i popped across the street to spec’s before they closed and picked up a couple of cigars (cohiba vanilla and tatiana cherry cream, i think) and smoked them during the gathering. there was an interesting girl who works at the place. she had a banner tattoo across her chest, so i asked her about it and she showed it to me: “per aspera ad astra”. i recognized it as latin, and knew “ad astra” meant “to the stars” (that aerospace background finally paid off! ), but i didn’t know the rest. she said it was a quote from seneca the younger (aka seneca, a roman stoic philosopher) and means “through difficulties to the stars”. after she got off work she hung out at the table with kojo, jamie, and myself, until her boyfriend showed up. i ended up staying out until 3am or so. saturday i ate at einstein bagels, where i was joined by the potts. i then gave sue a ride to her house on my bike, as i was headed to the harley dealer to pick up my real plate (yea to getting rid of the paper temp tag!). the dealership couldn’t find my 2nd key and security fob after i bought the bike, and they still hadn’t by this past weekend. so they were supposed to be ordering new ones for me this week. they also adjusted my throttle cable while i was there, as it had a lot of play in it. (but within a couple of hours it got play again…although not as much as before. i wonder how much more it can be adjusted before it needs to be cut?) i also described a rattling i started hearing in the front end when i hit bumps during the second week i had it. they said they would look into it during my first oil change. later saturday evening, jamie got me to go to the caronline collective one year anniversary party. in addition to seeing jamie, jay, and groovehouse, i also ran into a couple of people i hadn’t seen in awhile, met a guy i knew of through numerous friends but had never actually met (turns out he has even worse stories about chris seay’s ecclesia than i do! ), and re-met a guy who i’d met some months back once at onion creek when i met some people there for lunch. (he was surprised when, while talking to jay, he learned i was phliKtid.) i stayed at the party until maybe 10:30pm or so, then jamie and i left and ate a late supper at brasil. a week or two ago i ordered some accessories for my new motorcycle. hopefully they’ll be here within a couple of weeks. i’ll detail that more after they arrive. i’ve still got a few other changes i want to make to the bike, even once those are in. i still haven’t gotten around to verifying my ’55 bel air engine choice with the mechanic and getting that work started. i really should do that. and i still am planning on putting together an entry about my shopping and buying experience at the harley stores.